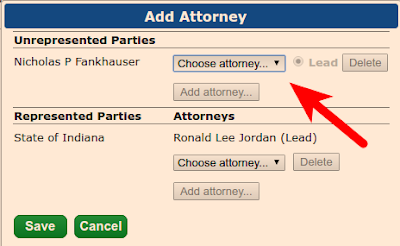 Adding an attorney to a case while e-filing. We have learned recently that Hendricks County will no longer add an attorney to a case when he or she files an appearance. They now depend on the e-filer to do that. You may add more than one attorney for any party. If the party is currently unrepresented, you may specify which of the attorneys you are adding is the lead attorney. You may add attorney(s) to more than one party, to cover situations where you represent multiple parties on the same case. If a party already has an attorney, you may still add an additional attorney. Be aware that there is no option to designate the "lead" attorney in this situation. Rather, the existing lead attorney is listed as the "lead" until they are withdrawn. This may occur when you are taking over for another attorney, but the clerk/court has not yet processed that attorney's withdrawal. Give us a call or email if you have any questions about this feature! support@doxpop.com or 866-369-7671. Doxpop just released a change to our process for fetching information about Recorded Documents and displaying document images. This change will increase the speed of the entire Recorded Document service. It's our early Christmas present to the folks who make heavy use of that section of our web site! In addition, a few weeks ago we provided a new button to return directly to your most recent search results from any of the document viewing pages, avoiding the need to page back through the intervening pages with your browser's "back" button. Give the improved Recorded Document section a spin and let us know if it makes your work easier! Correction to proposed Order/Notice post. A helpful person at the State's Court Technology office pointed out an error in my post of a few days ago (thank you!) I just went back and corrected it. Apologies to anyone who was confused by the first version. To read the updated version, click here. The main correction is that you *will* receive an accepted filing notification for a proposed order or notice, however, for most courts, it will not be a file-stamped copy. The lack of a file stamp often leads to concern about whether the document was really accepted and processed. Don't worry! if you received the accepted filing email, your document is on its way to the judge. In addition, some emphasis and detail has been to the section on checking to make sure the attorney is appropriately entered as an attorney of record for the case. In the past, such an omission was annoying, but not a serious issue. However, in the era of electronic document delivery, not being entered correctly means you won't get your order. The Counties using the CSI case management system apply the timestamp as a way to communicate the acceptance date to the judge in situations where she or he is viewing a paper copy. This may change as processes evolve, but for now, it may help you to know why this is different in some counties. Currently, this apply to Wells, Clay and White counties. The Knox County Courts have started allowing e-filing today, with subsequent filings becoming mandatory on February 10th, 2017. Orders and Notices will be delivered via the Odyssey E-Notice system. The sending domain for that system is "courts.in.gov", so make sure emails from that domain do not end up in your spam folder. All documents other than proposed orders or notices submitted through the e-filing system will result in the filer receiving a "Submitted Filing Notification" at the time of filing and later, an "Accepted Filing Notification" containing a link to the file-stamped copy. Proposed orders and notices are different. The "accepted filing" email for a proposed order or notice will contain a link to your document, but in most counties, it will not be file stamped, and it will never be a signed or approved document. The signed/approved version of the document will be delivered later, and through a different system. That means you will receive the approved order or notice directly from the court rather than the e-filing system, and the method of delivery may vary depending on the county. Some counties still use postal mail or the attorney's box in the clerk's office for local firms. Most counties use an "E-Notice" system to send you an email containing a link to the signed order or notice. Regardless of how the documents are delivered, we recommend setting an alert on the case using Doxpop so you will know when to start looking for delivery of the order or notice. If the county still delivers hard copies, you just have to wait for that delivery to occur, and if it doesn't happen in a timely fashion, call to inquire. Is the attorney listed on the case? If the attorney is not listed as an attorney of record in the case management system, the e-notice system won't know who to send the order/notice to. Look up the case on Doxpop, and look at the top of the case details page to make sure the attorney is listed to the left of the party he or she represents. If the attorney is not there, call the clerk to get this corrected. Note: Being attached as an e-filing service contact and being listed on the court's CMS are two different things. Is the e-notice system turned on for the attorney? In some counties, this is set up on a per-person basis, and if it is not turned on, of course nothing happens. Call the clerk to inquire. Is the email address correct? Have the clerk read you the email address from the e-notice system and have them help you correct it if necessary. Is there more than one record for the attorney? Some counties set up separate attorney records for the same person in different roles. For instance, they may use one attorney record for a person's private practice and another one for their part-time role as a public defender or deputy prosecutor. Adams: Delivery via E-Notice system. Emails come from co.adams.in.us. Allen: Delivery via E-Notice system. Emails come from courts.in.gov; Postal mail if attorney's email not in their system. Brown: Delivery via E-Notice system. Emails come from notify@browncounty-in.us. Cass: Delivery via postal mail or courthouse box for local attorneys. Clark: Delivery via E-Notice system only. Emails come from courts.in.gov. Clay: Delivery via postal mail. Daviess: Delivery via E-Notice system. Emails come from notify@daviess.org. Decatur: Delivery via E-Notice system. Emails come from efile@decaturcounty.in.gov. Delaware: Delivery via E-Notice system. Emails come from courts.in.gov. Dubois: Delivery via E-Notice system. Emails come from notify@duboiscountyin.org. Elkhart: Delivery via E-Notice system only. Emails come from courts.in.gov. Floyd: Delivery via E-Notice system. Emails come from courts.in.gov; Postal mail if attorney's email not in their system. Franklin: Delivery via E-Notice system only. Emails come from courts.in.gov. Grant: Delivery via E-Notice system only. Emails come from courts.in.gov. Hamilton: Delivery via E-Notice system only. Emails come from courts.in.gov. Harrison: Delivery via E-Notice system. Emails come from courts.in.gov; Postal mail if attorney's email not in their system. Hendricks: Delivery via E-Notice system only. Emails come from courts.in.gov. Henry: Delivery via E-Notice system only. Emails come from courts.in.gov. Huntington: Delivery via E-Notice system. Emails come from courts.in.gov; Courthouse box for local attorneys without an email in the system, Postal mail for others not in system. Jackson: Superior Emails using personal county email addresses, Circuit Court using Postal mail, Superior 2 using postal mail. Currently, Emails will come from jacksoncountyin.gov. They hope to implement E-Notice soon. Jay: Delivery via postal mail. E-notices coming soon. Johnson: Delivery via E-Notice system. Emails come from courts.in.gov; Postal mail if attorney's email not in their system. Knox: Delivery via E-Notice system only. Emails come from courts.in.gov. Kosciusko: Delivery via E-Notice system. Emails come from notify@kcgov.com. LaGrange: Delivery via E-Notice system. Emails come from notify@lagrangecounty.org. Marion: Delivery via E-Notice system. Emails come from courts.in.gov. Martin: Delivery via E-Notice system. Emails come from enotify@martincounty.in.gov. Monroe: Delivery via E-Notice system. Emails come from courts.in.gov. Morgan: Delivery via E-Notice system. Emails come from courts.in.gov; If attorney's address is missing, postal mail is sent with a link to the form and request for email address. Newton: Delivery via E-Notice system. Emails come from notify@newtoncounty.in.gov. Noble: Delivery via E-Notice system. Emails come from notify@noblecountycourts.org. Randolph: Delivery via E-Notice system. Emails come from court.notify@randolph.in.gov. Rush: Delivery via E-Notice system only. Emails come from courts.in.gov. Shelby: Delivery via E-Notice system. Emails come from courts.in.gov; Postal mail if attorney's email not in their system. Spencer: Delivery via E-Notice system. Emails come from notify@spencercircuitcourt.com. Switzerland: Delivery via E-Notice system. Emails come from notify@switzerlandcountycourthouse.org. Tipton: Delivery via E-Notice system. Emails come from courts.in.gov; Postal mail if attorney's Email not in their system. Union: Delivery via postal mail. Vermillion: Delivery via E-Notice system. Emails come from clerk@vermillioncounty.in.gov. Wabash: Delivery via E-Notice system. Emails come from notify@wabashcounty.in.gov. Wells: Delivery via E-Notice system. Emails come from notify@wellscounty.org. White: Delivery via E-Notice system. Emails come from notify@whitecountyindiana.us. Whitley: Delivery via E-Notice system. Emails come from notify@whitleygov.com. Bartholomew County moves to Odyssey. Access to court data through Doxpop unchanged. Over the weekend of December 3rd/4th, the Bartholomew County Courts converted to the Odyssey case tracking system, thus moving their data storage and administration to Indianapolis. If you use any of our "watch" services to keep an eye on cases or people of interest, we will be moving those watches over so they point to the cases and people that are a part of the Odyssey data feed. We run a process to convert these twice each day, but it is possible for notification of events to slip through the cracks between conversion runs so you may want to periodically do a manual check between now and the second week of January, after that, we'll be back to normal. Finally, one deficiency in the Odyssey system is that financial information is not exported in their data feed, so that detail will not be available after the transition. We regularly ask that the Court Administration add this to the data feed, but so far, we are told that it is not allowed because the clerks using the Odyssey system have requested that they not make that information available to us. If this information is important to you, please encourage the clerks you work with to tell the State Court Administration of your needs so we can get the information back online. Additionally, Tax Warrants have been moved out of the court case management system as a part of this transition. Doxpop intends to release a new service next in February 2017 that allows complete statewide searching of tax warrants for all counties. In the interim, you can obtain this information at the clerk's office. Monroe and Tipton counties have joined the E-Filing system since we last posted, and we have just asked them how they want payment to the Sheriff for Civil Process on new cases to be handled. In Monroe County, payments should be made through the e-filing system at this time. However, this is likely to change within the next month. In Tipton county, attach your payment to the document when you deliver it to the Sheriff.